When it first came to my attention that students were misusing prescription drugs in hopes of improving their grades or to get high, I must admit that like many other university professionals, I did not see it coming. We were utilizing our time and resources addressing the use of “street drugs” by our students. You know the ones that are dangerous and illegal. Our minds were as vulnerable as our students, altered by the myth that the inclusiveness of the word “prescription” was surrounded by a safety net. Then bad things started to happen. Universities nationwide started seeing an increase in student emergency department visits that were related to prescription drug misuse. This got our attention and we knew we had to do something. We quickly found ourselves knee-deep in the familiar adage: Houston we have a problem. At OHIO University, a multi-faceted approach is used to address the non-medical use of prescription drugs. Several grants from Cardinal Health have allowed us to conduct poster campaigns to bring awareness to the problem. 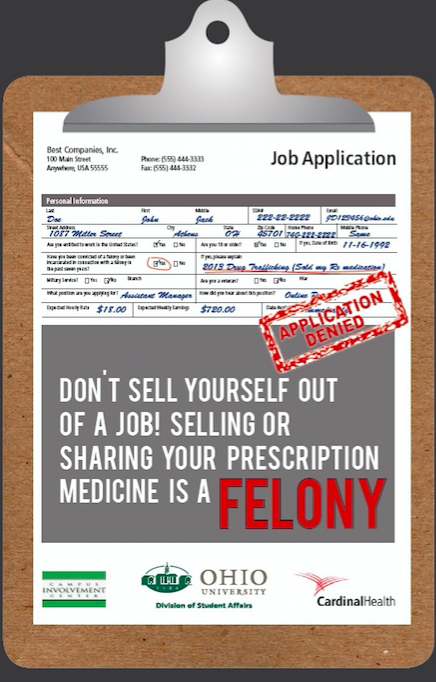 The posters utilize social norming messages and outline the health and legal consequences associated with the misuse of prescription drugs. 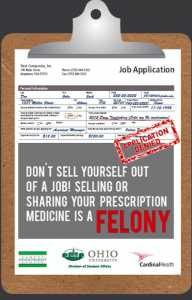 One popular poster features a job application that is red stamped “denied” because the applicant listed a felony charge for selling his prescription medication. We have been fortunate to forge collaborations across campus to spread our message and further educate students, faculty, and staff about the misuse of prescription drugs. During midterms and finals we post flyers in the bathroom stalls of the university library that target the misuse of prescription stimulants. Last spring we collaborated with several student groups, POWER/GAMMA and the Pre-Pharmacy Club, to deliver two Generation Rx collegiate programs, The Adderall Dilemma and It’s Drug Abuse. We provide inserts for prescription bags at our campus pharmacy that explain the importance of taking medications as prescribed, keeping medications safe, and disposing of unused medications properly. Prevention efforts at OHIO University appear to be working. Between 2014 and 2015, the percentage of students reporting the use of someone else’s prescription medication dropped from 18% to 13.6% (OHIO AOD Survey, 2014, 2015). In the coming year, we plan to continue our poster campaigns and deliver more Generation Rx programs. We will be implementing ScreenU for prescription drugs, along with the alcohol and marijuana components. We also plan to present to first year students through learning communities. With increased education and prevention efforts in place, we are cautiously optimistic that the OHIO University campus will continue to see a reduction in the non-medical use of prescription drugs. We recognize that this is a complex problem that challenges universities nationwide to establish best standards in the field of prevention. As professionals, our first step is to institutionally move beyond the credulous myths associated with the misuse of prescription medications. Only then are we able to brainstorm and implement solutions that positively affect the well-being and safety of our students. Ann Addington is the Assistant Director for Tobacco, Other Drugs, and Recovery at Ohio University. She oversees the collegiate recovery program, R.I.S.E. (Recovery to Inspire, Share, and Empower). 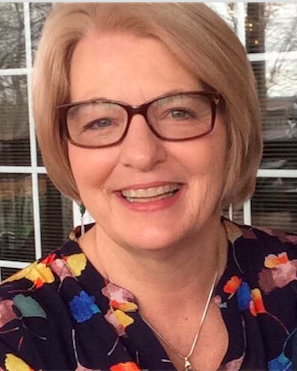 She is a tobacco cessation educator and a certified SMART Recovery® facilitator. Through risk reduction programs, she coordinates campaigns on prescription drug abuse, tobacco and other drugs. She is a member of the university Tobacco-Free Committee, the University Hearing Board and provides risk reduction psychoeducation for students with alcohol and drug violations.